Answer: Certainly. I hope you’ve noticed how daylight lasts longer in the summer and shorter in the winter. 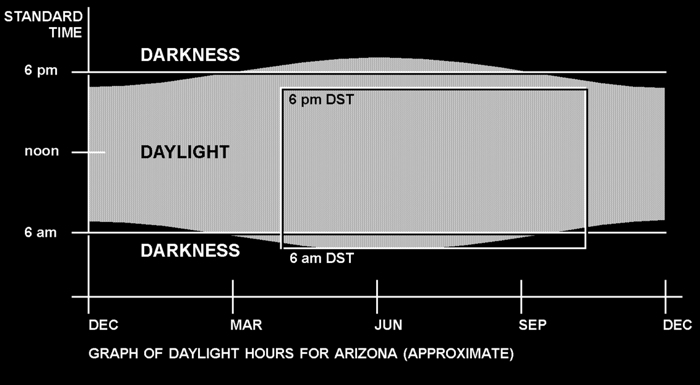 For Arizona, it works out to around 14 hours of daylight in June, and 10 hours of daylight in December (see graph). Farther north, say Greenland, the difference is more extreme. They get 20 and 4. At the equator, it’s always 12 and 12. Boring, but at least it never snows there. This variation in the amount of daylight is a consequence of the tilt of the Earth’s north/south axis relative to its orbit around the Sun, and it repeats in this same pattern every year. Daylight Saving Time is simply an adjustment to our clocks to take advantage of the extra daylight available during summer. It should really be called “daylight shifting time.” In most places, the shift takes place in April. Clocks are set to one hour later. As a result, the extra daylight available now falls during a useful time of day (6 am instead of 5 am). This “shift” of clock time is represented by the DST rectangle superimposed over the natural day/night cycle. The shift back to standard time happens in October.